The World Solidarity Forum has run, across the month of March 2018, a campaign to raise awareness about the many different kind of violences that women are subject to across the world. The goal was not just to remind people that much work is still needed to put a definitive end to such abuses but also to show what programs and activities are taking place that work in this direction. Our campaign came to a coronation with the event that took place on the 27th March at the European Parliament in Brussels. The event, titled “Upholding the Rights of Women – Global Actions to Stop the Violence”and hosted by Mrs Mary Honeyball MEP, which we thank deeply for her and her team’s support, took the form of a panel conference aiming to highlight initiatives that are working to stop violence against women. Following a networking lunch for participants, the keynote speech was delivered by Mrs Marina Marchetti, Team Leader for unit B.1, in charge of gender and non-discrimination, at the Directorate General for International Development and Cooperation (DG DEVCO) of the European Commission. Mrs Marchetti started her speech by introducing the audience to the work of DG DEVCO in the area of gender non-discrimination, specifically highlighting its focus on development’s work and the promotion of the rights of women in countries that are benefiting from development programs. A new, very important program in this area is the Spotlight Initiative: a collaboration between the European Union and the United Nations aiming to stop violence against women in many regions of the world. The Spotlight Initiative tackles issues like the exploitation of migrant workers, femicide, sexual and gender-based violence in Africa, Asia and Latin America. A great part of its work is prevention through education and dialogue with social counterparts. Mrs Marchetti remarked how the expertise of the UN was indispensable to ensure a real impact on the ground as well as to make sure governments and national authorities can work with it to realise the best outcome. Mrs Marchetti’s intervention was followed by a Q&A session that further tackled the impact of the work of DG DEVCO in the area, as well the limits of its political mandate. 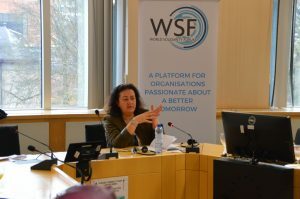 The following part of the conference’s program was a panel discussion: the first panellist to take the floor was Mrs Sinem Yilmaz, Coordinator in Brussels of the European Network of Migrant Women. She focused her presentation on what more needs to be done to address the many dangers and abuses faced by migrant women across their travel. From violence in their home country, that pushes them to migrate, to inadequate policies in countries of destination, including the EU, that make them completely vulnerable. She argued that current policies need to become more comprehensive as a gender blind approach clearly does not work. Our second panellist was Mrs Shumaila Anwar, Human Rights Activist, Student in Conflict Resolution and Governance and Founder and Director of Shumaila’s Mothers. Mrs Anwar originally comes from the region of Jammu Kashmir, where violence against women is widespread. She reminded the audience of the situation on the ground where women are subject to domestic and sexual abuse and humiliation.This happens in the context of the conflict in the region, where violence against women is used as a tool to further oppress and divide the local population. This approach victimizes twice women, first by inflicting pain and then by ostracising them from their own community. She remarked that women in the region are highly skilled and hard working, but that any initiative to support them has failed due to political resistance, and launched an appeal for the empowerment of these women. She plead the international community to intervene in the region more actively with programs that could stabilise the situation on the ground and protect from further abuses, referring to the Spotlight Initiative as one instrument that could greatly help. The third and final panellist, Dr Angela Franz-Balsen, an expert in Gender Issues and Former Lecturer at the University of Lüneburg, analysed the social causes behind violence against women. She explored the concept of masculinity and its association, in its current form, to traits like aggressiveness and egocentrism. She argued that we are seeing a backlash of a chauvinistic approach as a reaction of a part of society to the emancipation and strengthening of women, as well as of other categories commonly victim of abuse, in recent years. Her conclusion was that the way to prevent such backlash and further violence is an open dialogue between genders that takes an holistic approach aiming to solve issues such as gender equality but also environmental sustainability. She applauded the Spotlight Initiative as it takes exactly an encompassing approach in tackling the issue of violence against women. The event came to a conclusion with a second Q&A session that allowed for a fruitful dialogue between the audience and the panel who could discuss topics such as the role of feminism in a global, interconnected society, practical actions to be taken to protect migrant women when they arrive in Europe and what the international community can do to stop the violence in the region of Kashmir.